Our goal is to help you close deals faster. Shifting from a traditional virtual data room provider like Intralinks, to an innovative and modernized provider like DealRoom, is a complete game changer for management teams and clients. With DealRoom, users can complete every aspect of diligence within one, centralized platform. 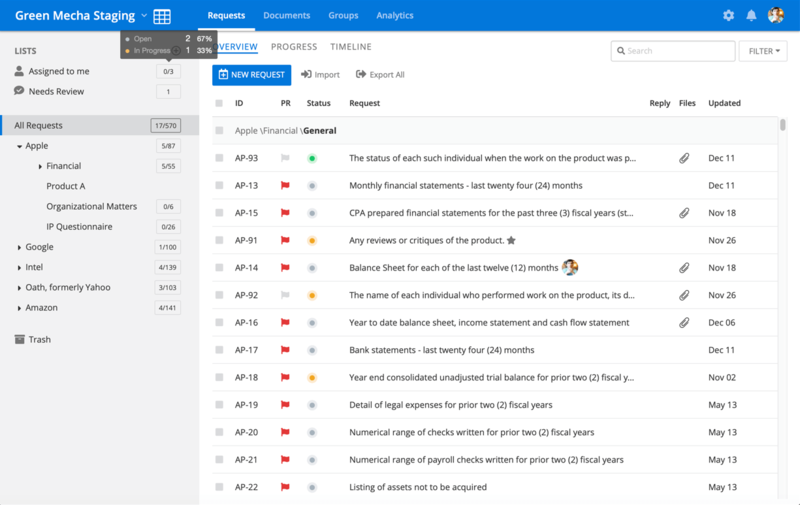 No more going back and forth between a virtual data room, email, and Excel spreadsheets. 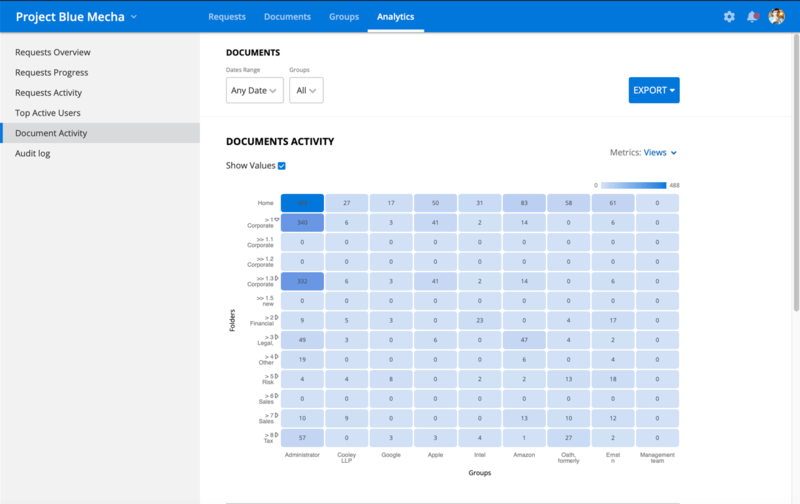 Instead of going back and forth between one-off emails, Excel spreadsheets and Intralinks’ virtual data room, users can create and customize all diligence requests within one, centralized platform. Users can assign tasks, set roles, communicate, share files, send date reminders, and more. They can also filter through requests by priority, status, label, date, and specific user roles. Our M&A software utilizes smart technology to help M&A teams close deals faster and more often, giving them a competitive edge. Teams benefit from features that traditional VDRs such as Intralinks, can’t provide. Users can easily drag and drop files, bulk upload, live link documents, and smart search. We are also constantly adding updates and new features that stem from customer suggestions. To start diligence faster than ever, teams can choose from our library of premade templates. Or they can import their own with the click of a button. If teams need assistance, they can send over their preexisting template to their designated customer support manager, who will help them format and upload it into the room. When each part of diligence is spread out across multiple channels such as email, Intralinks, attachments, bulk downloads, etc. useful data is lost. If all of diligence goes through one platform, teams capture much more data. They can analyze and learn from activities such as buyer engagement and files of interest. Traditional virtual data rooms like Intralinks, charge users per page alongside additional overage fees. Since data storage cost less than .0023 cents / GB, we don’t think charing 70 cents per page is fair. That’s why we offer flat rate plans that include unlimited data, users, projects, customer support. For example, our per project pricing is a one time flat rate and the room stays open for however long the deal lasts. With our software, users can update requests within the platform, and everything is updated in real time. Users have access to the most accurate diligence list at all times. Whether you on your phone, tablet, or computer, your room is accessible. No more passing an Excel tracker back and forth with traditional VDRs like Intralinks, or worrying about version control. Since it is common for teams to be working on more than one deal at a time, we offer unlimited projects to help keep everything easily accessible and organized. For example, instead of switching back and forth between Intralinks and DealRoom for two seperate deals, teams can conveniently manage both deals within our platform under one login. 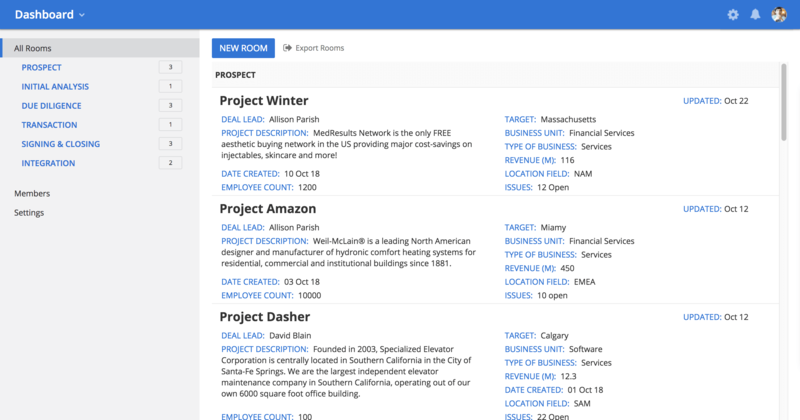 As soon as a user logs in, the dashboard neatly displays every deal within the room. The dashboard shows a brief outline of the project and when each project was last updated. We understand the importance of collaboration. Whether it be internally, or externally with your client, users need to be able to work with other users within the platform. This is why we offer unlimited users. Teams can add as many users as they need to get the deal closed quickly. To invite a new user, all you have to do is simply put in an email and send the invite. Unlike with traditional VDRs such as Intralinks, new users are responsible for putting in all their own information. With DealRoom, all due diligence can go through the platform. Because of this, insightful analytics are captured that would otherwise be lost when users do a bulk download from a traditional VDR like Intralinks. Analytics are also captured on user, document, and file activity. They are displayed using progress charts, tables, heat maps, and more. Apply filters such as date range, groups, lists, and priority to find exactly what you are looking for. All analytics can be exported into a PDF for convenient reporting. Our software was specifically designed with a simple interface to make it user friendly. Users can start uploading documents and creating diligence tasks within minutes. However, we understand that our software is different from traditional VDRs, like Intralinks, that teams are accustomed to. In order to assist with the learning curve, we have a library of short help guide videos users can watch. If users still have a question or concern, our customer support team is only a quick call, chat, or email away. They are available 24/7 to assist you. Commonly, due diligence tracking occurs on Excel spreadsheets and teams have to pass an Excel tracker back and forth. This method can be very time consuming and cause version control issues. With DealRoom, all diligence can run through the platform. 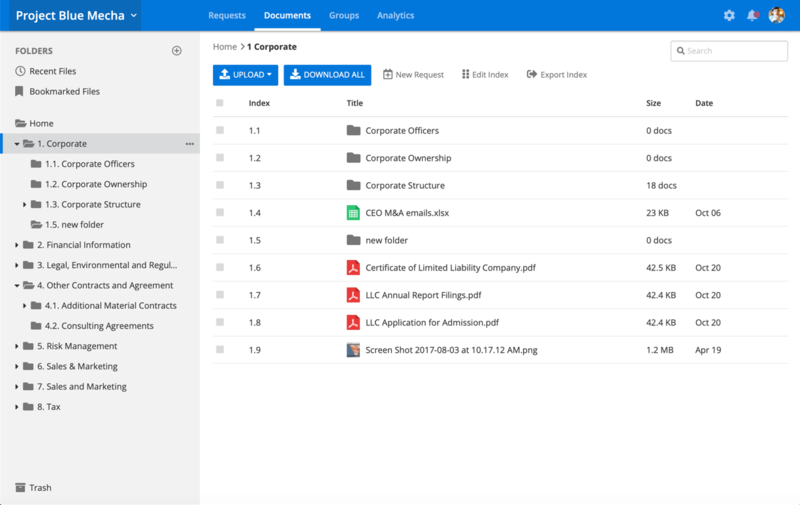 Users can create new diligence request, attach documents and files, assign roles, set due dates and more. And everything is updated in real time. We want our customers and their clients to have the best diligence software experience possible, even with services that go beyond our direct realms. We pride ourselves on being more than a typical data room like Intralinks. In order to accomplish this, we choose to integrate with additional software platforms that are leaders within their respective industries such as Slack, Salesforce, and Office 365. With our m&a platform entire deal process becomes seamless and efficient. Due diligence data room for buy and sell-side deals, as well as team project management. Stay on top of due dates, tasks, and team communication. Our software is not just the best diligence management platform, it also includes a secure, full featured virtual data room within the platform. Post M&A integration management software helps increase post-close success and avoid common post-merger integration mistakes. Parties other than DealRoom may provide content, such as services and products on website. These are considered “Third Party Materials” and can also include views or recommendations. DealRoom does not claim responsibility for any Third Party Materials and does not provide warranties in regards to Third Party Materials. Links to these materials are for your convenience, and are not endorsed by DealRoom.